Start off on all fours and make sure your knees are slightly behind your hips. Your hands should be shoulder-width apart and spread your fingers out wide. Press your hands into the mat and gently tuck your toes under and take a deep inhale, then keeping your hands pressed into the mat exhale deeply, lifting your knees off the floor and straightening your legs as much as you can. Try to remember to inhale and exhale deeply and you can enjoy moving within your downward dog pose. You can paddle out your feet, enjoying feeling the stretch at the back of the legs. See if you can create more space between your shoulders and relax your neck. Relax the muscles in your face. Try lifting your hips higher on an inhale, and pressing your heels into the floor as you exhale. It’s fine if your legs are bent, just enjoy the juicy stretch and the feeling of creating space in the back of the body. After a few deep breaths, slowly release your knees down to the floor, untuck your toes and gently release your hips back down into Child’s pose. You can come into Downward Dog from a resting Child’s Pose position – from Childs’ Pose you come up onto your hands and knees and then into your downward dog as described above. Or you can come into downward dog from a deep standing forward bend (Sanskrit name: Uttanasana) by placing your hands on the floor and stepping back into the pose. Another alternative is from Plank Pose. Move into Downward Dog by drawing your hips up and pressing your heels back. You can come back into Child’s Pose after downward dog by lowering your knees back down to the floor. Or you can come back into a standing forward bend from Downward Dog by stepping your feet forward between your hands. Alternatively, you can shift back into plank after by lowering your hips and drawing your shoulders forward over your wrists. 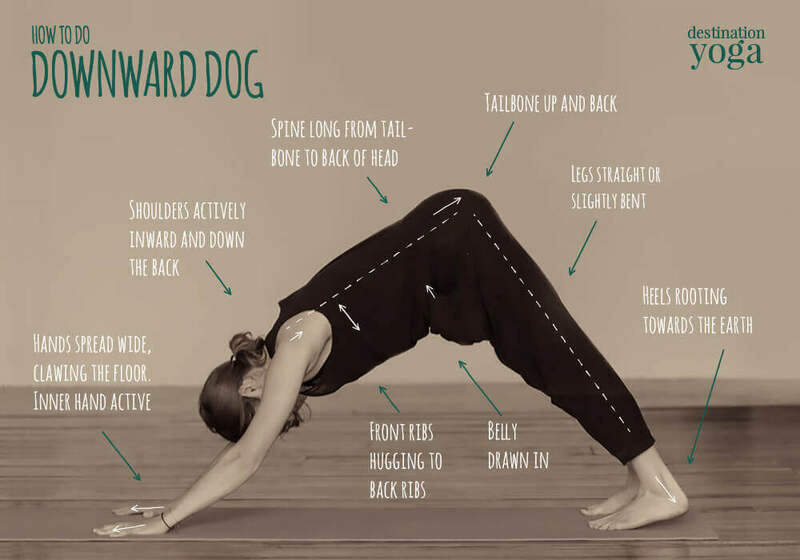 If Downward Dog is too uncomfortable to start with you can recreate the pose benefits in a simpler way by standing in an upside down L facing the wall. Place your hands on the wall and shift your hips back so your back is parallel to the floor. Try to create the same space between your shoulders and along your spine while drawing back the hips and pressing your feet into the floor, extending your legs. If you have sensitive wrists you can buy ‘wedges’ to put under your wrists (thick end under wrist). This reduces the angle and therefore takes some pressure off the wrists. Downward dog stretches out the back of the legs and your lower back and creates space between your vertebrae and between the shoulders. It can be very calming and is a great position to come back to for a focus on your inhale and exhale, which you should try to make as smooth and steady as you can. It offers us a delicious stretch – usually during a sequence of standing poses, which will be working your legs – and it can be a very calming, yet energising pose once you have practiced for a while and built some strength. Only stay in it for as long as is comfortable, and you can always take a rest in Child’s pose. You should avoid Downward Dog if you have any shoulder, neck or wrist injuries.